This is another one of those “headphone” CDs. Though the music is pretty amazing to the naked ear, with headphones it will blow you away. The Story of M’s music is in the same realm as your Trespasser’s William, Fiel Garvie, Mazzy Star, etc. But some of their songs are a little bit “cleaner” for lack of a better term. I think of that shoegazer music as being fuzzy and though some tracks are like this, at times they also sound a little like Dido (“Heaven” and “High”). “Sailor” is a true shoegazer song. Gorgeous, full, with lots of sounds that you’ll want to catch. I also really dig “Medicine”. It reminds me of Portishead. The music is complex using several instruments including piano (Rhodes and regular), guitars (acoustic and electric) bass (stand up and electric) synthesizers and even tambourine! Emilie Berstein’s voice is heavenly. It purrs and hollers in an equally beautiful fashion. If you like ambient, trip-hop, pop, you should check out The Story of M.
I think I’ve done it again. I’ve found another shiny gem in the vast world of independent music. I present to you Story Of M. Based out of California and fronted by Emilie Bernstein, Story Of M takes the listener on a fantastic journey with serene soundscapes and compelling lyrics. Their debut “These Little Crimes”, which contains the hit single “Sailor” is definitely making its mark. The opening track “Sailor”, reminds one of sailing on the ocean, with peaceful contemplation, while Emilie’s voice and lyrics complement the lilting arrangements. Some other songs that grabbed me immediately were “Joan Of Arc”, an emotionally charged song in which Bernstein talks about the various issues in a relationship. This album definitely seem like an honest look into someone’s life. I strongly feel that anyone can relate to the themes that Emilie creates with her music. The album, which was produced by Ian LeFeuvre showcases exquisitely layered songs that always allow Emilie’s vocals to shine through. Bernstein, being the daughter of a film composer, seems to draw her inspiration from all different art forms, and combines music and drama to produce a very fascinating sound. 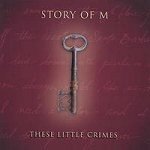 Story Of M are currently preparing to tour in support of their album. I urge you all to check out “These Little Crimes” and show your support at their live shows as they bring their passion to the stage. Comment: this is average at best. If you want to be inspired, check out mclaughlin or tori amos. The composition on this is harmonic at times, the lyrics are pedestrian, unmoving for the most part. Nothing unusual here. Lead vocals are drab – pretty much like every other west coast garage band but without the kegger. The skinny lead singer is better to look at than to listen to, and that isn’t saying much. Big disappointment for such a successful songleader.